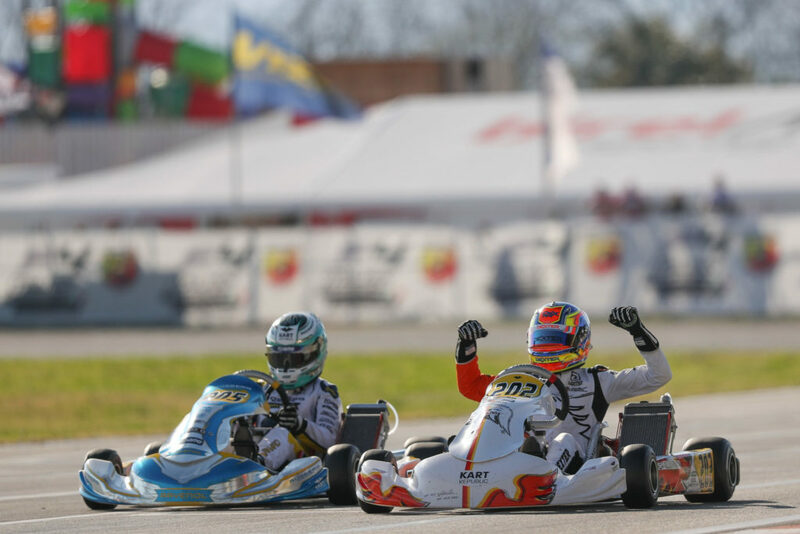 The 2019 WSK Super Master Series couldn’t dream of a better location than Sarno and the Circuito Internazionale Napoli to award its titles. At the exception of the OK Junior Final won by Artem Severiukhin, all classes have seen one of their top favourites claiming the laurels with Rashid Al Dhaheri winning both trophies (final win & title) in 60 Mini, Dexter Patterson taking it all in OK and Bas Lammers dominating the field in KZ2 at the end of an intense Sunday of competition in the shadow of the Mount Vesuvius! 145,Lammers Bas(NLD),Sodikart(SODIKART/TM-RACING/BRIDGESTONE), Sarno, 24 March 2019. WSK Super Master Series, © 2019, Alexandros Vernardis / The RaceBox. KZ2: Lammers takes it all! The Italian top guns showed their teeth all weekend in the KZ2 class but it was a Dutchman who eventually beat them all in Sarno! At the end of a well-fought Final, Bas Lammers (Sodikart/TM) claimed the victory and secured his second title in the WSK Super Master Series after 2017! From Pole position (thanks to a win in the Prefinal A), Marco Ardigo’ (Tony Kart/TM) had the best start to lead the field in the opening stages before Lammers took control of the race on lap 4. From then on, the Dutchman was untouchable as Ardigo’ turned his focus on his Tony Kart teammate Matteo Vigano (Tony Kart/TM) catching him in third place. The two Italians eventually crossed the line in that order with Adrien Renaudin (Sodikart/TM) missing the podium for less than a tenth of a second. The Frenchman rapidly recovered from 7th on the grid but couldn’t find the right spot against a flawless Vigano who kept all doors closed until the chequered flag. Simo Puhakka (Tony Kart/Vortex) concluded his run from 11th to 5th ahead of Marijn Kremers (BirelART/TM), Emilien Denner (Sodikart/TM), Anthony Abbasse (Sodikart/TM), Francesco Celenta (Praga/IAME) and Giuseppe Palomba (Croc Promotion/TM) closing up the top ten. Further down the order, Belgium’s Yannick De Brabander (Intrepid/TM) put up on a good show by recovering from 34th on the grid to 13th at the flag while, on lap 3, Paolo De Conto (CRG/TM) touched wheels with Lorenzo Camplese (Tony Kart/Vortex) in a battle for 5th place that let to the latter dropping out of the race (click here for the full KZ2 classification). In the point standings, Bas Lammers (235 points) is crowned with the title in the 2019 WSK Super Master Series in front of Lonato’s winner Adrien Renaudin (159) and Marco Ardigo’ who jumped past Marijn Kremers. 202,Patterson Dexter(GBR),Kr motorsport(KART-REPUBLIC/IAME/BRIDGESTONE), Sarno, 24 March 2019. WSK Super Master Series, © 2019, Alexandros Vernardis / The RaceBox. Dexter Patterson (KR/IAME) was the one to beat this weekend in the Senior class! Already the fastest in Friday’s Qualifying then again topping the provisional Heat classification the next day, the Scot won Sunday morning’s Prefinal A before controlling the Final from start to finish. An impressive weekend for the Kart Republic driver who was rewarded with the series title just ahead of Taylor Barnard (KR/IAME). The winner of the Prefinal B kept close to his countryman all thorought the 17 laps of the race before increasing the pressure with the chequered flag at sight. The two crossed the finish line split by just 0.040 seconds but it was enough for Patterson to claim his second win of the series after Lonato. Completing the podium was Brazil’s Gabriel Bortoleto (CRG/IAME) who kept Juho Valtanen (Kosmic/IAME) at bay in 4th. Dino Beganovic (Tony Kart/Vortex) recovered seven places to close up the top 5 ahead of Lorenzo Travisanutto (KR/IAME). Fourth on the grid, the World Champion was caught up in a slight contact in the first lap but still kept himself on track unlike six of his colleagues who got involved in an incident at the first hairpin. Dilano Van’t Hoff (Exprit/TM) fought his way through to 4th before dropping back to 7th overall in front of a deserving Gabriele Mini’ (Parolin/TM). After facing trouble in the Prefinal B, the Italian started the race from 30th on the grid but climbed up the order in the opening laps to finish 8th, followed by Nikolas Pirttilahti (KR/IAME), Sebastian Montoya (Tony Kart/TM) and Maya Weug (BirelART/TM) who edged the top ten for less than a second (click here for the full OK classification). 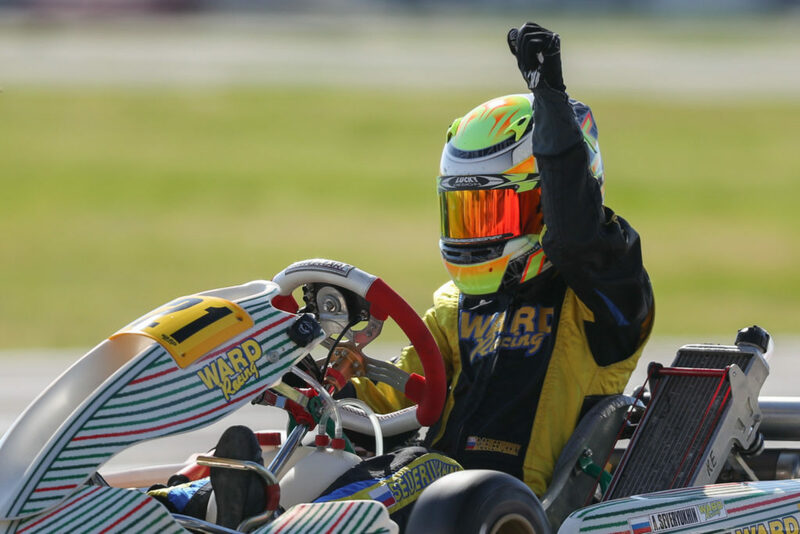 In the point standings, Dexter Patterson concluded this year’s WSK Super Master Series on top with 392 points with Taylor Barnard as runner-up at 290 points followed by Lorenzo Travisanutto with 285 points. 321,Severiukhin Artem(SWE),Ward racing(TONYKART/VORTEX/VEGA), Sarno, 24 March 2019. WSK Super Master Series, © 2019, Alexandros Vernardis / The RaceBox. OK Junior: Severiukhin wins, Day misses the title to Antonelli! The quest for the series title in OK Junior found its conclusion in the most dramatic way in Sarno when the trophy passed from hand to hand within minutes after the Final chequered flag! 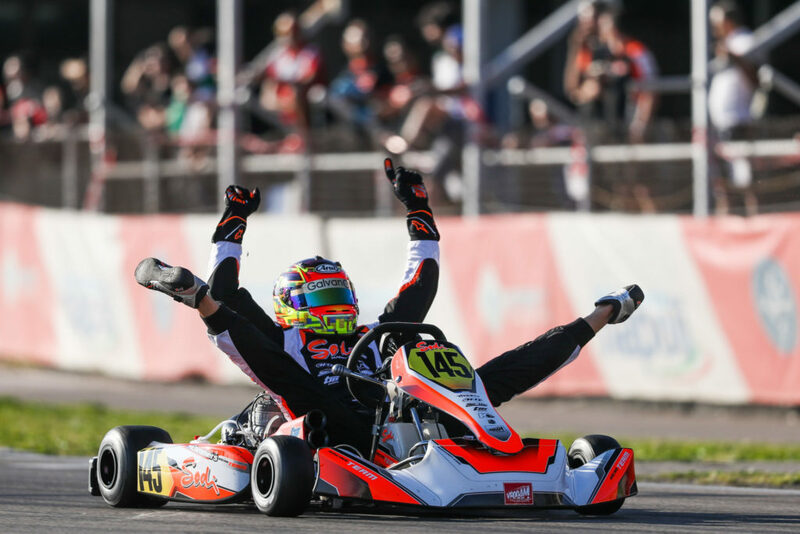 In the morning, the script already got knocked out on its head when the two points leaders Andrea Kimi Antonelli (KR/IAME) and Thomas Ten Brinke (FA Kart/Vortex) neutralized themselves in the Prefinal A, the Italian seeing his title hopes temporarily put on hold. An unexpected turn of event that opened the door for Jamie Day (Exprit/Vortex) who went from challenger to prime favourite as he needed to finish in the first two positions to secure the trophy. The 13-lap race started well for the Polesitter (and Prefinal B winner) Artem Severiukhin (Tony Kart/Vortex) who quickly put himself away from his closest chasers. Those included Laurens Van Hoepen (FA Kart/Vortex, winner of the Prefinal A), James Wharton (FA Kart/Vortex) and Jamie Day. But while the Ricky Flynn Motorsport drivers got into a solid explanation, the Brit kept a tight gap until lap 5 where he first went past Van Hoepen before taking the 2nd place from Wharton one lap later. From then on, the race stabilized itself and Severiukhin took the win in front of Day who, at this stage, had done enough to grab the title for a tiny point over Antonelli. But a five-second penalty was later given to Day for a wrong positioning of his front fairing resulting from contact. Laurens Van Hoepen consequently recovered the second place in front of William Silverholm (Tony Kart/Vortex), James Wharton, Marcus Amand (KR/IAME) and the unfortunate Jamie Day. Spain’s Josep Marti Sobrepera (Tony Kart/Vortex) fought his way through from 20th to 7th, followed by Alfio Spina (KR/IAME), Enzo Trulli (CRG/IAME) and Tymoteusz Kucharczyk (Parolin/TM). Click here for the full OK Junior classification. In the point standings, Andrea Kimi Antonelli (200 points) finally kept the first spot ahead of Artem Severiukhin (199 points) with Jamie Day (191 points) completing the category’s podium. 518,Al-dhaheri Rashid(ARE),Parolin racing kart(PAROLIN/TM-RACING/VEGA), Sarno, 24 March 2019. WSK Super Master Series, © 2019, Alexandros Vernardis / The RaceBox. Rashid Al Dhaheri (Parolin/TM) didn’t tremble to grab the highest spot of the 60 Mini Final this Sunday in Sarno! 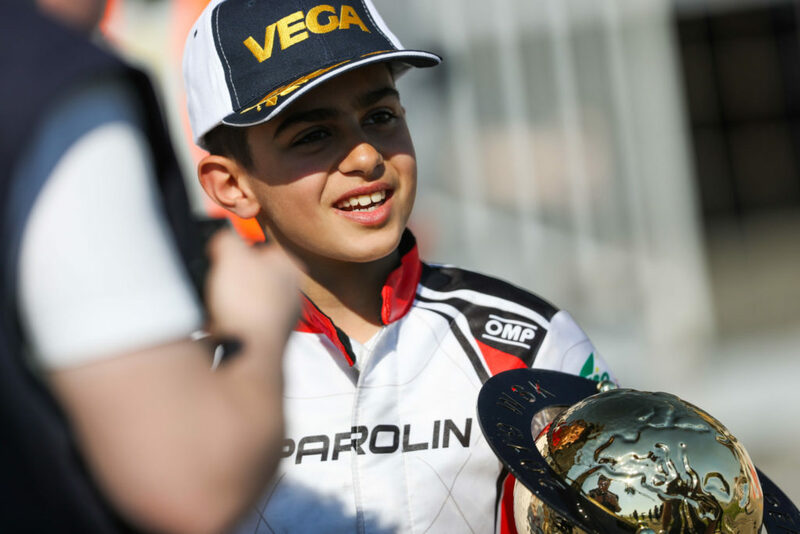 The young driver from Abu Dhabi claimed his third win out of four rounds in this year’s series to eventually be crowned with the title in impressive fashion. From 6th on the grid, the Parolin protege only needed two laps of the Sarno circuit to put himself in the lead against Polesitter (and Prefinal B winner) Maciej Gladysz (Parolin/TM). The two offered a close battle through the 8 laps of the Final but the Polish couldn’t get past his opponent on the line (+0.212 seconds). Andrea Filaferro (Tony Kart/TM) completed the podium as the Italian was prompt to recover from 14th on the grid to steal the third place from Maksimilian Popov (Parolin/TM) on lap 3. The Russian eventually finished fifth behind his countryman Maksim Orlov (Parolin/TM). Coming home in 6th was Alex Powell (Energy/TM) in front of Arjun Akshay (Parolin/TM), Gerasim Skulanov (IPK/TM), Coskun Irfan (Parolin/TM) and Giovanni Trentin (Parolin/TM). Winner of the Prefinal A, Joel Bergström (Parolin/TM) fell down to 17th in the order after a difficult opening lap before recovering to 12th overall, one position before the Belgian Ean Eyckmans (Parolin/TM) who couldn’t fight for the title against Al Dhaheri the way he would have wanted this weekend in Napoli (click here for the full 60 Mini classification). In the point standings, Rashid Al Dhaheri walked away with the title (322 points) with Ean Eyckmans second (246) and Alex Powell third for a mere point (245). The WSK comes back already next weekend for the opening round of the Euro Series at the same venue of Sarno. An event that you will be able to follow again via our website.